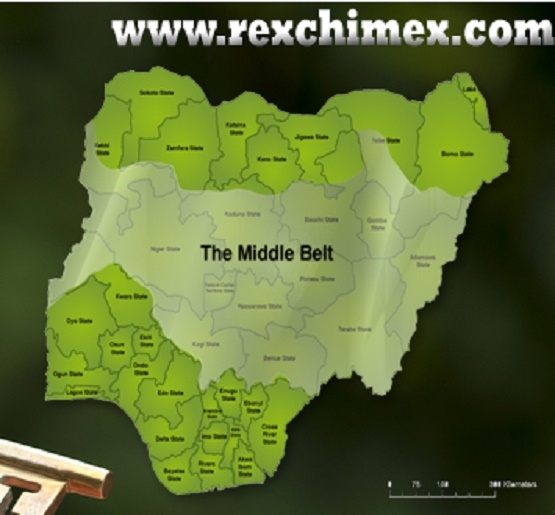 The Middle Belt is a human geographical term designating the region of central Nigeria populated largely by minority ethnic groups and stretching across the country longitudinally. The Middle Belt is indeterminate in that it lacks designated "borders" and is characterized by a heterogeneity and diversity of peoples and cultures. The eminence of manifold minority groups to some degree constitutes an ethno-linguistic barrier in the country, drawing a separation between the principally Islamic North and the mainly Christian south. The region is a convergence of these cultural domains and maintains a tremendous degree of ethno-linguistic diversity, with languages of the Afro-Asiatic, Nilo-Saharan, and Niger–Congo families, three of the primary African language groups, all being spoken. Areas of Nigeria which are generally referred to as belonging to the Middle Belt are: Kwara State, Kogi State, Benue State, Plateau State, Nasarawa State, Niger State, Taraba State, Adamawa State as well as the southern parts of Kaduna State, Kebbi State, Bauchi State, Gombe State, Yobe State and Borno State. The definition of the Middle Belt areas are subject to great debate due to the presence of significant number of ethnic Hausa, Fulani and Kanuri groups. In addition, the Yoruba of Kwara and Kogi have a strong affinity with the larger Yoruba body and frequently prefer not to be associated with the Middle Belt identity.